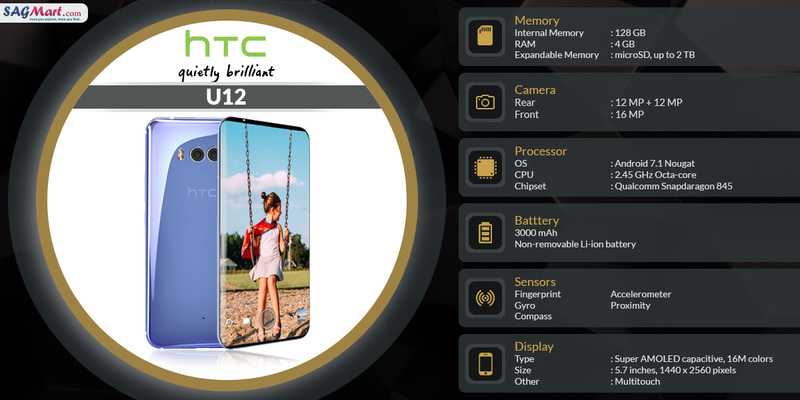 HTC U12 smartphone is believed to feature a 5.7-inch Super AMOLED display with a resolution of 1440x2560 pixel. Powering the device may be a 2.45GHz Octa-core processor coupled with 6GB of RAM and 64GB of inbuilt memory space, which is rumored to be further expanded up to 2TB via microSD card. The handset is expected to be backed up by a 3000mAh Non-removable Li-ion battery and the optical part of the smartphone may include a 12-megapixel Dual rear camera with a 16-megapixel front shooter for selfies. The Dual-SIM smartphone may operate on Android 8.0 Oreo OS.